Technics Blenders can be Dual and Multi-Channel and optimized to prepare quality stocks that meet targets for Sulfur, Vapor Pressure, Acidity, Viscosity, Density, and Water Content. These systems leave the Technics facility with the required valves, flow meters and other instruments pre-wired to the integral SCADA system with local operator interfaces. A computer and software package is provided for remote control, monitoring, and reporting. For Crude Oil and Heavy Fuel Oil applications, the system is often heat traced and insulated. A typical process moves feedstocks through double block and bleed manual ball valves with each stream monitored for pressure. A coriolis meter provides volumetric and mass flow rate levels as well as a direct density measurement while flow control valves throttle the feed stocks proportionally to provide the proper blended product. Prior to injection in the blend header, actuated valves are used to isolate the channels. The homogenization occurs in the blend header by use of a jet mixer which avoids the pressure loss encountered by the lower cost static mixer. However this mixing can sometimes be simple pipeline turbulence or by using in tank mixers. 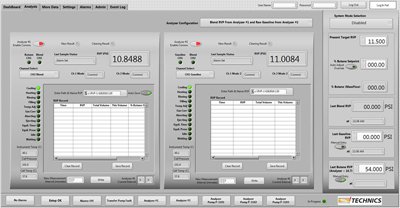 A sampling quill withdraws blended product from the discharge header and transfers in in a fast loop for analysis. 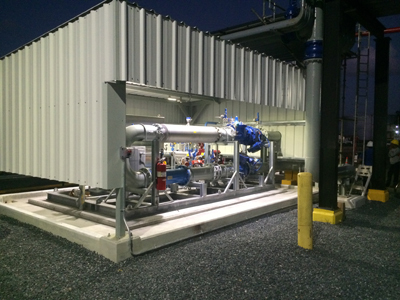 Two rotary vane pumps are normally used in a duplex configuration allowing for back up in the event of failure. The transfer pump moves the sample rapidly to the analyzers and return the unused portion back to the discharge header. Blended Fuel for sampling exits a Swirl filter and is conditioned for pressure, temperature, and water content before entering the analyzers. These analyzer discharge the analyzed fuel into an atmospheric tank which automatically returns the waste fuel to the discharge header. The key to a high performance Fuel Blending System resides in the analysis for such things as Sulfur, Vapor Pressure, Density, and Octane. Technics can adapt many combinations of analyzers to serve the need of the refinery. See our Online Analysis section for more information. Critical to an effective blender is the control system. These systems utilize Technics’ LOGOS as the software management and operator interface platform. A local HMI provides access to all of the systems parameters and has a graphical interface to the process. 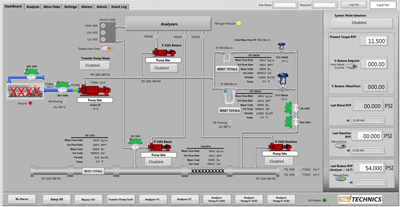 A SCADA system is included with a workstation, monitors and all peripherals. User Access control for Administrator, Supervisor, and Operator. Adjustable alarm levels for all parameters with date and time stamped alarm log. Full interface to the analyzers, and flow meters through Modbus digital communications eliminate resolution loss.